You’re likely reading this because you are on the receiving end of a pretty crummy feeling. 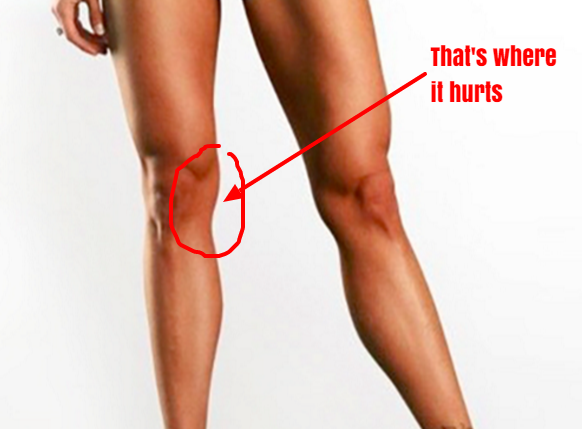 In the midst of some form of activity, you likely twisted or turned your knee at a bad angle, and heard a loud pop. Even if there was no pop, you’re probably researching an MCL sprain because you believe you have some degree of MCL injury. There’s a good chance you’ve already figured out that the ligament on the inside of your knee is your MCL. That’s where you heard the pop and now you’re trying to figure out how long recovery time is for an MCL sprain and what the treatment protocol looks like. I’ve had multiple MCL injuries (of very different degrees). Below, I’ll share all the details that are often hard to find regarding the injury, recovery, rehab, and treatment. Think you actually have an ACL sprain instead. Try this blog. Recovery time for an MCL sprain is going to depend entirely on the grade of the sprain. There are typically three classes/grades of MCL sprains. Eloquently they are named grades 1,2, and 3. 3 is the worst. If you have a grade 3 sprain you probably can’t walk. A grade 3 MCL sprain will leave you feeling completely unstable and very anxious when on your feet. Grade 3 tears are by far the most rare MCL injuries. If you’re reading this and seriously think you have a grade 3 tear, stop reading this and visit an orthopedic doctor who can order an MRI for you (more on doctors below). However, if you simply have pain at the location of injury, a lack of mobility, and a general sense of instability, you are likely somewhere on the spectrum of grade 1 or 2. 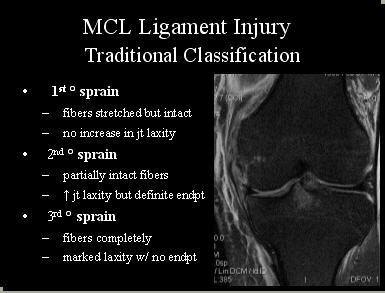 If you’re like me and you want a really solid classification for your MCL injury, you’re about to be disappointed. Even a good orthopedic doctor, equipped with an MRI of your MCL sprain, will have difficulty pinning down exactly what degree of sprain you’ve experienced. I’ve had a grade 2 sprain that took me 9-10 months to recover from. On my other knee, I was diagnosed with a grade 2 sprain that took only 4-6 weeks until I felt back to normal. Conversely, I’ve also had what would be classified as a grade 1 sprain take nearly 4 weeks as well (almost as long as my “grade 2”). However, most minor grade 1 strains return to about 90% health within only 7-10 days. Why is this? It’s because there is a spectrum of severity within both grade 1 and grade 2 sprains. There is a spectrum to this injury, and it’s important to realize right away that every MCL sprain is it’s own journey. It’s very hard to pin down exactly how long it will take you to recover. Below, I’ll highlight a few signs that you may be on the mend and a few treatment options that may help accelerate the process. Should I see a doctor about my MCL sprain treatment? The answer is, maybe. If you think there’s a good chance you have a grade 3 MCL sprain (most don’t, maybe you do) then you need to go to an orthopedic doctor. He will confirm an injury to the MCL and order an X-ray first (it will tell you absolutely nothing) and then order an MRI. Knee Injury Tip: Orthopedic doctors love taking X-rays. If your knees are largely healthy, and you’re visiting for a possible ligament injury, you can ask your doctor to skip this step – and you will save some money. X-rays can’t tell you anything about your ligament injury. If you’re confident you don’t have a grade 3 sprain, you can avoid the doctor entirely. You’re injury may require rehab, but you can find a number of good rehab facilities near you. The orthopedic doctor will take you through all of these steps and then just recommend rehab anyways unless you have a complete (grade 3) tear of the MCL. A grade one MCL sprain can be one of the easiest ones to diagnose. If after the initial injury you feel progress day to day, you are probably looking at a grade 1 type of sprain. As mentioned above, there aren’t just three degrees of injury to an MCL. There is a spectrum. If on that spectrum of MCL injuries you find that your injury seems to be mending relatively quickly (i.e. progress is coming along in the first week), you likely have what would be classified as a grade 1 sprain. A grade 1 MCL sprain recovery time is typically anywhere from 1 week to 3 weeks. A grade 2 MCL sprain can be the most difficult to diagnose. Really bad grade 2 MCL sprains often feel like what the injured party would imagine a grade 3 (complete tear) would feel like; however, a non-complete tear isn’t as significant and can health without surgery; which is an important distinction between the two. A grade 2 often will see very slow progress within the first few weeks of recovery. This what leads the injured party to believe they have a grade 3 injury. Often, an MRI is done to make the distinction; however, there are a couple of other telltale signs you can use to tell the difference. Stability is a big factor between a grade 2 and grade 3 MCL tear. Even though you may feel a weakness, lack of stability, and pain with a grade 2, there shouldn’t be a feeling of giving way. A loss of control can be a signal of a complete tear. A grade 1 MCL sprain recovery time is typically anywhere from 1 months to 9 months depending on recovery protocol and the severity of the sprain. This is why it can be so hard to pin down, because the grade 2 covers such a broad spectrum of the severity of MCL sprains. 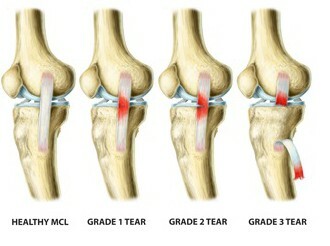 A grade 3 MCL sprain is a complete tear of the MCL. This means that surgical intervention is the only way to restore a functioning MCL. There is not a recovery time for the injury; as it will not health itself. As with ACL injuries, it is possible to rehab and strengthen the knee enough to do many activities without having it repaired. However, it can be really difficult to maintain an active lifestyle while going through this protocol. 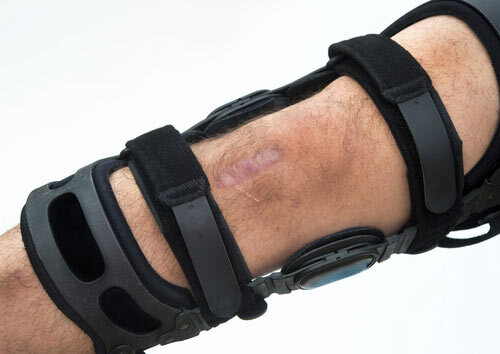 If opting for surgery, a grade 3 MCL surgery recovery time can last anywhere from 3-6 months. If you have a grade 1 — or lower grade 2 MCL sprain — over-bracing the knee could cause some of the muscles responsible for knee stability to atrophy; lengthening your recovery time. If you’d like additional support after the initial injury for these types of sprains, I recommend a simple knee sleeve (a compression sleeve). For more aggravated grade 2 MCL sprains I recommend the full MCL brace above. These types of braces will hold your knee in place well. Bauerfeind makes some really good braces like this. Do I need MCL sprain rehab? A week following the immediate injury, if you’re still unable to walk well and generally feel as though the injury has not improved, you may be in severe enough territory to require a 6-8 week rehab protocol. A good knee rehab specialist can help you with a proper rehab protocol. Even if you are feeling better and returning to full health quickly. It’s still a good idea to strengthen the muscles surrounding your leg to prevent further injury. Here’s a good resource for knee injury prevention. This guy has tons of great exercises on his Instagram. What is average MCL Sprain Rehab Time? There is a difference between MCL recovery time and MCL sprain rehab time. The time it takes to recover from an MCL injury is listed above, and as we mentioned, it is a murky diagnosis, but one that you are best able to evaluate using the guidance above. MCL rehab time is a bit different. MCL rehab time refers to the time it takes for a person to complete a full MCL rehabilitation program. An average MCL rehab program is going to vary depending on the type of sprain. Grade 1 Rehab: MCL rehab can begin immediately following the injury and should be focused on proper mobility and recovering full range of motion in about a 2-4 weeks window. Grade 2 Rehab: MCL rehab should begin after any initial swelling and intense pain has subsided after the injury. The program should center around improving the quality of body mechanics and range of motion in the knee and hip. The program should last approximately 6-8 weeks. 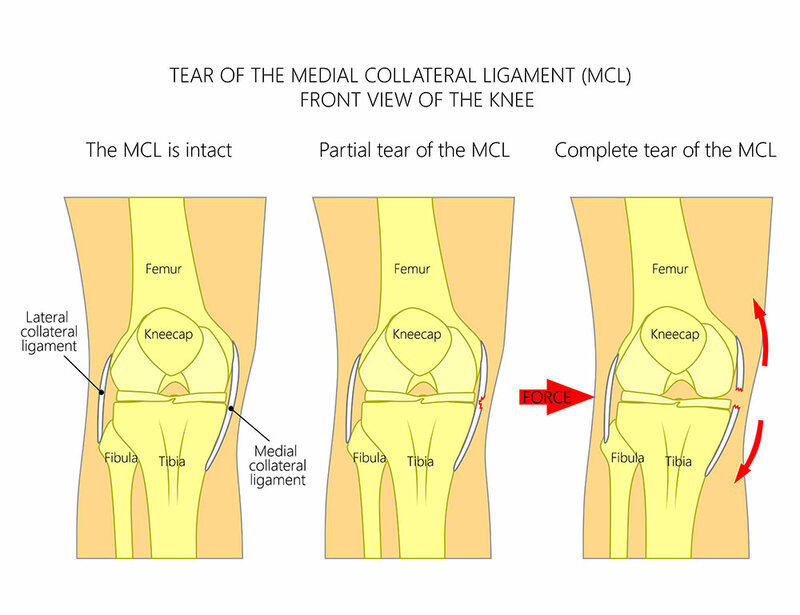 Grade 3 Rehab: MCL rehab for a complete tear can be divided into two categories. Pre-hab before a medical intervention (knee surgery) and rehab afterwards. “Prehab” for a grade 3 sprain should focus on strengthening the quadriceps and hamstrings prior to the surgery. This will improve MCL recovery time after the surgery and prevent significant atrophy. Rehab for a grade 3 mcl tear should focus on all the same things as a grade 2 sprain does; except the process will be a much slower moving; as it will begin immediately following surgery. Early focus should be on recovering full range of motion. The entire program can take anywhere from 2-3 months. Rehab for all MCL sprains: All MCL sprains should include a continuous improvement protocol following the completion of any program. This is a state of common practices following a rehab protocol aimed at continually strengthening the nee and muscles around it to prevent future injuries. What exercises for MCL rehab? Single leg side squats are a good exercise to include in quadricep strengthening rehab protocols. Single straight-leg deadlifts with low weight are great for strengthening the glutes and hamstrings. I wish I could tell you there is a magic bullet that accelerates recovery. Unfortunately, rest is the main element to MCL sprain treatment. ICE and NSAID’s are always recommended, but they are usually most helpful after the initial injury. It’s very important that you avoid trying to stretch the injury until you are nearing full recovery! Your MCL sprain could be made much worse by trying to stretch it or increase it’s range of motion before it has had a chance to health. This is a common treatment mistake. Have you had an MCL injury before? What were your experiences? How quickly did you recover, what treatment options did you pursue? Leave questions and comments below and I will respond. Next Did I Dislocate My Shoulder? It sounds like me. I fell off of a stool and twisted on the way down. My knee was quite unstable. Its been almost 2 months now and I still have aching and soreness. I still wear a brace 24/7. MRI showed a stage 1 mcl tear. I was inactive for more than ten weeks with a dislocated shoulder, then i decided that i wanted to get fit so i went on a mini indoor trampoline I think i did too much too soon as both my knees and ankles are in pain , mostly my knees. I noticed that my feet were not landing straight. I have very bad pain inside both knee caps. Sometimes the pain is a bit better , walking a bit better, but by the middle of the day the pain seems to get worse. My Doctors are useless x rays show mild ostioarthritis but i think i have ligaement injury too. I am 52. Could you advise me. Thanks, Elaine. I could not walk for days because of my sprained MCL. It took 10 weeks of rehab and exercise every to finally recover most of my movement back. One of my keys was having good help. My trainer motivated me every day. And my chiropractor helped me regain mobilization. I am most grateful for their help. Hello, I got MCL sprain on my right knee by miscreants who gave me a blow on my MCL by some blunt heavy substance while I was leaving office lately. After that I got recurring injury on MCL one month later while i was under immovable knee brace. Now It is 7 weeks after recurring sprain on 2nd time. I started Physiotherapy for a week now. But still I cant fold my knees properly. I had an MRI earlier but Doctor only said me that it’s not a complete tear. Can you suggest me what should I do at this point? For your information, I am not feeling well after PT for 4 days. As stated above, these injuries often take very long to heal. PT is one of the best ways to strengthen the knee, but often non-complete tears can take 9-12 months until a full recovery is made. Permission to use image on this page. Please contact me. I think a have a level 2 Mcl sprain. Maybe 1. It’s been 2 weeks. I’m able to walk but I’m limping when I do. I also find it painful to straighten my leg. Is that common? Should I try to straighten my leg with exercises and bare the pain to do I avoid straightening? I have no problems bending my knee. I’m getting better from a MCL but still have some mild pain, specially when I wake up and late on the day. I feel no pain whn walking or even jumpin, only when I hace side movements of the knee.